I awoke this morning from a dream where I was sat on the edge of a tennis court hand rolling a silk scarf where my late paternal grandfather, my ex brother in law and my husband were playing tennis. The court was in the car park of a converted glove factory in Milborne Port where I once rented a flat and where my Printers were, and still, are based. I have never hand rolled a silk scarf and have only recently started sewing and my grandfather passed away when I was 13 so he had never met the other members of this dream. I did wake up remembering the feel of silk scarves and painting them and so naturally my thoughts led onto my first ever painting on silk, a scarf which was eventually hand rolled for me. In 1988 I was half way through an HND in ‘Design Communications’. I was supposedly specialising in Illustration and animation however the animation department closed after the first year and the illustration tuition was focused on getting us into jobs rather than becoming the next Ralf Steadman. I wasn’t happy on this course in Ipswich and had tried, unsuccessfully, to transfer to a Degree course. We had a trip to London to what I think was a graphic design materials show at the beginning of my second year. It was meant to be trade only and so we were meant to do our best not to look like students, but of course we all did, and were obvious with our eagerness to get any free samples. In amongst all the suited salesmen ( as they were mainly men) there was a stand with no fancy displays. A ‘bloke’ wearing jeans and T shirt with a large pile of Silk Painting starter kits was stood looking uncomfortable and very out of place.. For some reason I had been attracted to the sound of painting on silk and this was the first time I saw anything about it. I couldn’t afford to buy a kit then but I took there card and sent it to my parents saying this was absolutely what I wanted as a birthday present, please! The chap was Alan Hebdon from ‘The Art Factory’ in Stratford London. I was extremely lucky and that November a ‘Javana’ silk painting kit was delivered to me for my birthday. It contained a wooden frame, a 90cm square of silk, box of pins, a dreadful brush, a tube of gutta and five small pots of silk paint in Red, yellow, blue, green and black. It was everything I needed to get started straight away. I had absolutely no idea where or how to start let alone what to paint. 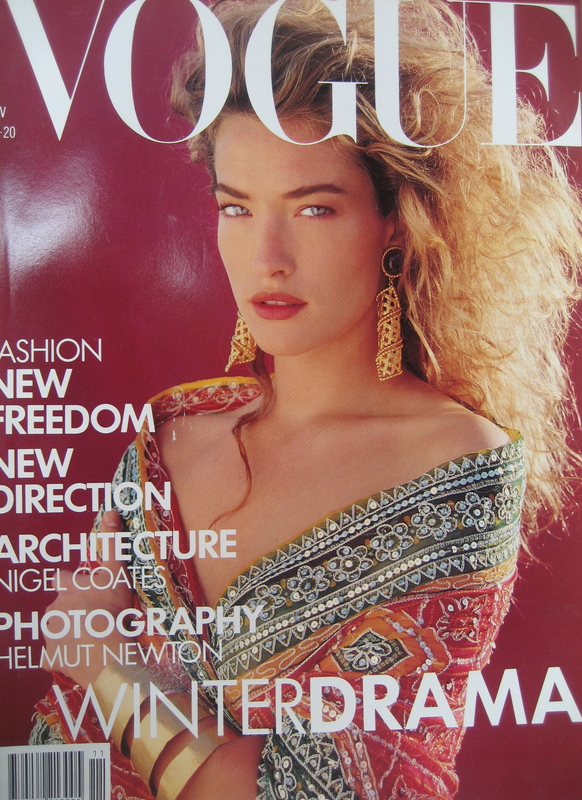 I was a regular subscriber to Vogue magazine however, and that months cover had a stunning scarf on it. With a spark of inspiration I began on a large ‘doodle’. I started by drawing the gutter outlines as a border around the edge of the scarf, then hundreds of small triangles and circles that were later filled in with paint. The silk paint is liquid so as soon as a loaded brush touches the silk all the paint pours out and spreads until the gutta line blocks it. The gutta is a liquid latex gum that dries once it has soaked through the silk. When dry it’s a hard barrier to the paint. This brand can then be soaked in cold water where it dissolves leaving the silk smooth. I spent every evening finishing this large scarf that was stretched on the frame on my shared flats living room floor. I loved every minute of it and from that moment on I was hooked on silk painting. I managed to buy a second metre of silk from a shop in Ipswich and so then started my second scarf, this time in pastel shades. By the time I’d finished them I needed more paints and a decent brush. I decided I needed a trip to London and visit The Art Factory and stock up on supplies. Stratford in early 1989 was nothing like the post Olympic Stratford of today. The Art Factory was a very small shop on a busy road run by the two jeans -clad guys I’d met at the show. I was like a kid in a sweet shop in there. Unlike their stand at the trade show, this shop was overflowing with art equipment. Even now I love art material shops and then I couldn’t believe the selection of paints, brushes and sketchbooks let alone a whole display stand with silk paints on it. I spent all of my hard earned cash on silk, various paints including pinks and turquoise that are notoriously difficult to mix, gold and silver guttas along with more of the dissolvable clear. 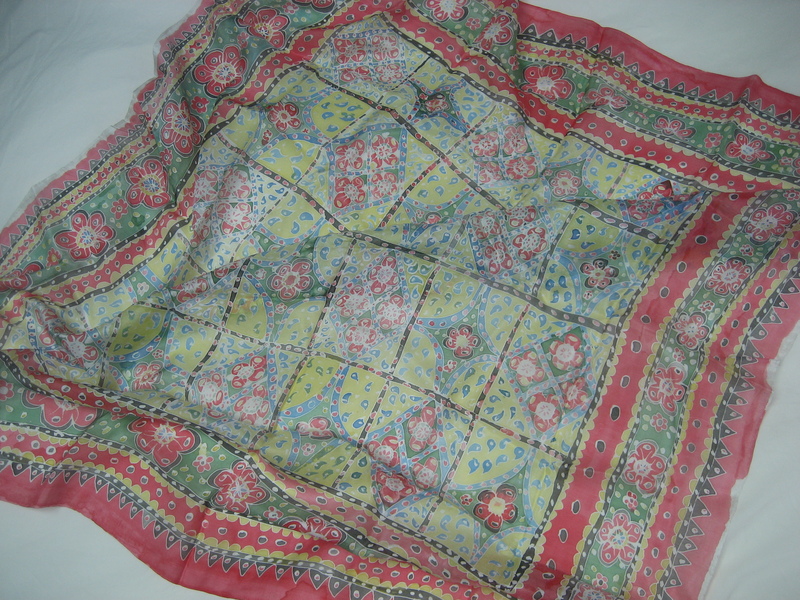 Just before I left I plucked up the courage to pull my two silk scarves from my bag to show them. To my utter surprise they were impressed and there and then asked if I would demonstrate for them at shows and talks at Art groups! I was so shocked but immediately accepted and so my career as a Silk painter began. Beneath their shop, the basement was rented by a band called ‘The gutter Brothers’. Nothing to do with silk painting, but everything to do with fun! A great friendship began with the guys from the Art Factory and we all followed The Gutter Brothers. I often wonder where they are now. In June 1989 I demonstrated at the ‘Artists & Illustrators ‘ show at Olympia in London. Alan had introduced me to William Weil of George Weil & sons. This very well established silk importer was diversifying their business and with their years of importing Chinese silk, painting on silk was a natural progression. Over the next few years I regularly demonstrated for both companies and learned my trade from numerous talks at Art groups and WI meetings across London and the South East. I even worked in the George Weil fabric painting shop that opened in Hanson Street with the lovely ‘ Cliff’. Early in 1990 I was ready to set up on my own and so ‘Possi’ was born. I continued to work closely with Alan and George but by 1992 my business was well established at my home in the West Country and I gradually lost touch with alan and the rest of the Art Factory team, but I continued to purchase all my silk from Wiliam Weil, until I stopped painting in 2009.